A blog and The Life In Between : Wedding Mood Board. Mood board that keeps me on track. I was never a "mood board" type of person but planning a wedding has made me spend way more time on Pinterest putting together boards to share with the wedding planners, florists and so on. 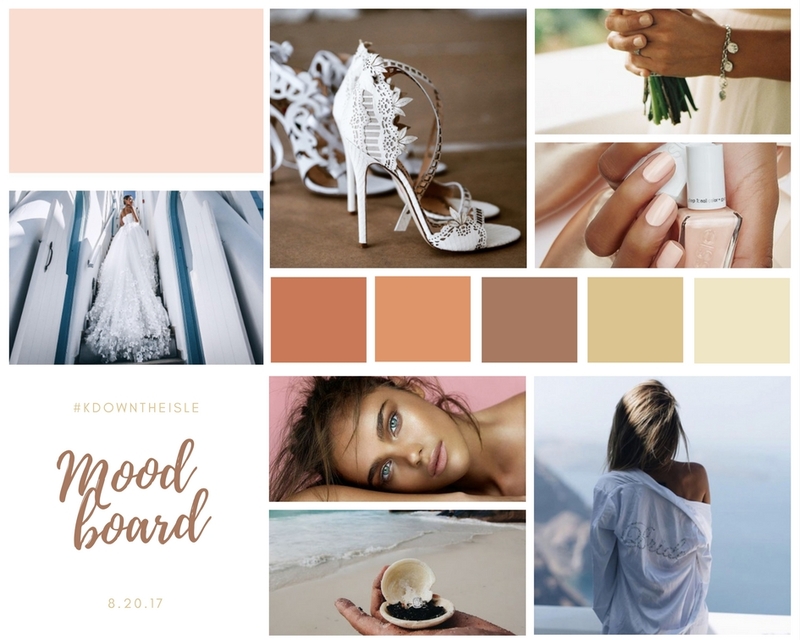 I kept catching myself liking different colors, props and it started to look like five different weddings in one board so eventually I had to create a mood board as pictured above and keep it on my desktop when pinning new things on Pinterest to stay on track - let me tell you, it was a life changer. Pick 2 main colors & stick with them. Let two colors be your main ones and pick a few other shades that are similar to those main ones as shades for any additional items you may want to have at your wedding. Ex: I picked white and blush to be main colors, but I am including golden tones along with warm brown tones into the mix for items to be placed around the venue as decor. One mood fits all. Yes, that's the hard part, pick up to 10 images to include into your mood board so that you can constantly remind yourself of what you'd like your makeup/hair etc. to look like on the day of. It will help you pick items and additional things you'll need along the way. Creating multiple mood boards for makeup / venue / hair / flowers does not work -- at the end of the day you'll just feel overwhelmed. Pinterest board. Take a break from planning and go back to your wedding board. Once you open it, all the colors and mood should be in sync - it should look just like an album of a wedding. Stalking. Do some stalking on weddings that took place at your wedding venue. It will visually help you imagine yours and will help you get an idea of what color tones, decor looks the best at that type of a venue. Educate your guests. I find it very helpful to give guests a visual board of colors/mood of the wedding so that everyone is in sync with outfits and no one shows up in a dark knit dress when the wedding palette is pastels. OK, that might just be me being OCD but I am finding it helpful when guests ask about what to wear. Etsy. The website has almost become my homepage because of all these great, unique ideas they have. Just when we thought we had it all figured out with menus, seating chart etc. I decided to take a look at Etsy and found this cute idea -- shortly we ended up redoing most of the details hehe. So before you fully commit to something check out both - Pinterest and Etsy. I hope those of you planning a wedding find this post helpful, if you have any advice or tips on planning I'd love to hear it!